Sony’s skipping the E3 2019 conference this year as, we assume, it beavers away working on its PS5 launch plans. Instead it’s taking a leaf out of the Nintendo playbook, launching a new series of live streams where it will reveal its upcoming slate of games. The first of these ‘State of Play’ events has now spilled its goods and, to be honest, it was a little disappointing. Focusing almost entirely on new PlayStation VR titles, there was no sign of long-awaited PS4 titles such as Death Stranding or The Last of Us 2. Now, that’s almost certainly so that Sony’s got something to hold back for the buzz period around E3 but the whole thing was still a little underwhelming. Here’s hoping Sony kicks things up a gear for next time. That’s not to say the first State of Play stream didn’t have a few gems on show though. See all the action in the stream replay embedded below, as well as our thoughts on the best of what was revealed. With his Jarvis-powered helmet and augmented reality-targeting tech weaponry, Iron Man’ Tony Stark has been living the fictionalised VR dream for decades. 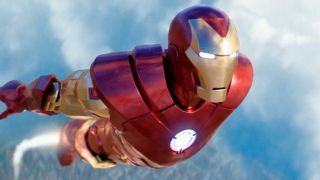 Now PlayStation VR owners will get a taste of the Marvel life for themselves in a new game that puts you in direct control of Stark’s Iron Man suit. Only a cinematic trailer was revealed during the State of Play event, but you can guess what’s going to play out here – hand cannons, line-of-sight in-helmet target painting, stomach-churning jetpack flights and endless rib-tickling rich-boy quips. A match made in heaven, No Man’s Sky is finally getting a dedicated VR mode. When the universe-exploring space simulator was first launched, many noted how perfectly the experience would be suited to a VR edition, with its never-ending procedurally generated world and unique alien life. Well, that wish is about to become a reality – the previously announced No Man’s Sky Beyond update will include a dedicated virtual reality mode for the PlayStation VR headset. That’s in addition to the online overhaul that’s about to drop too – could No Man’s Sky be about to become the first procedurally generated, crafting, survival, VR space MMO? That’s quite the transformation for what was initially seen as a disappointment. Well played Hello Games, well played. First announced at Paris Games Week, we haven’t heard much about PSVR’s Blood and Truth recently. However the Guy Ritchie-like action VR title finally has a confirmed release date of May 28, 2019. We’ve tried it out a few times at preview events and were suitably impressed (if not slightly alarmed) by the gritty and realistic nature of Sony’s VR first-person shooter. Everyone loved Job Simulator, a staple of basically every VR platform currently available. Now it’s time to take a break from the office and head on holiday. Vacation Simulator is headed to PSVR, letting you enjoy a ridiculous trip away in a highly-interactive VR environment where almost everything can be played with. And if you don’t have PlayStation VR, don’t panic – it’s headed to other VR platforms too. Concrete Genie is the perfect example of Sony’s prowess when it comes to indie titles. For those who haven’t heard of Pixelopus’ Concrete Genie yet, it’s an upcoming beautiful action-adventure about a bullied teenager called Ash. Finding that his artistic ability is more magical than he previously thought, Ash aims to paint his desolate hometown back to life. In addition to revealing a new story trailer for Concrete Genie, Sony also revealed the game will feature PSVR mode and will release in “fall 2019”. There’s only a month to go until Sony’s survival horror Days Gone launches. We essentially know everything we need to about the game but, to stoke the flames of excitement, State of Play treated us to a brand new story trailer. The latest addition to the brutal Mortal Kombat series is just around the corner, so of course Sony dropped a brand new story trailer unveiling Jax, Liu Kang, and Kung Lao as playable fighters. The trailer also teased that MK11 will see fighters meeting their past selves.